There are all sorts of reasons why you should bring gamification into your work environment. CRM adoption isn’t one of them. Well, at least it shouldn’t be your main focus. Take a step back for a second, and remember why your company purchased Salesforce in the first place. If you’re a CEO or VP of Sales, your goal and the reason for the investment was probably quite simple: If you could just measure what’s happening within the sales organization, ultimately you could motivate what you want to see happening more often. Companies like Comcast, Kelly Services, Stanley Black & Decker, Concur and dozens of others who are seeing big results from sales gamification share a common trait: They’re singularly focused on the sales behaviors they want to drive: making more calls, following up on leads, shortening their sales cycles, taking new products to market faster or getting more client meetings, to name a few. When you take those critical sales behaviors and launch contests and leaderboards around them, you can watch your sales team’s competitive side kick into high gear and they’ll be excited to do it. 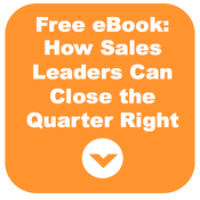 But the key is that the goal isn’t “adoption.” It’s motivating the right sales behaviors that will help you sell more and grow faster. And because salespeople understand that the leaderboards are populated based on what they enter into Salesforce, adoption will come along for the ride. So, if you’re considering gamification for your sales team, start first with identifying the behaviors you want to see more often that you know will drive sales; then figure out how to track it in Salesforce, and just like that, adoption will follow. Adoption is obviously a great byproduct of sales gamification, but, as Bob explains, it should be considered just that: a byproduct. Make your main product an increase in critical sales behaviors, and you’ll realize the potential gamification offers as a serious game changer. Thinking about launching gamification for the sole purpose of achieving CRM adoption? Here's why you should think again.